I drank this Strawberry Avocado Smoothie almost every single morning for breakfast through the first trimester of my pregnancy – it’s all I wanted! 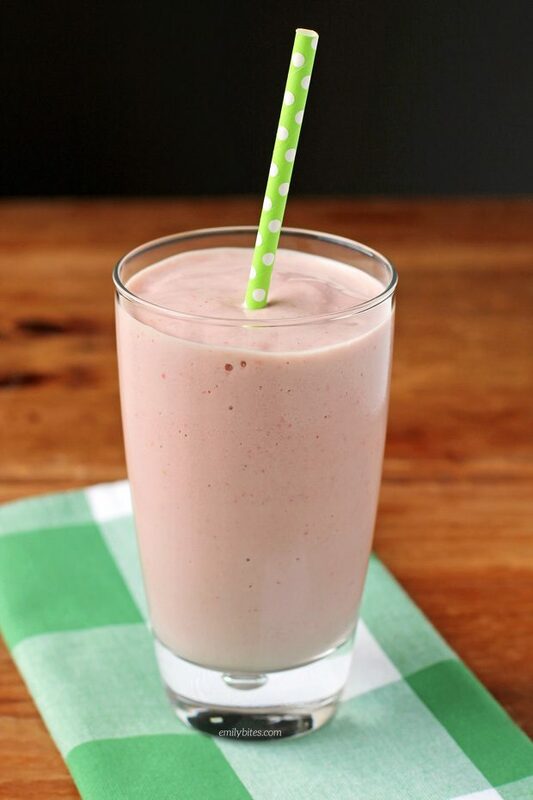 Cravings aside, this smoothie is absolutely delicious, perfectly sweet without being overly so, and filling enough to keep me happy until lunch. Plus it’s a great way to start your day off with 28 grams of protein! I love adding avocado to my smoothies for the creamy texture and the filling healthy fats. It blends right in and the overall flavor is still fruity. 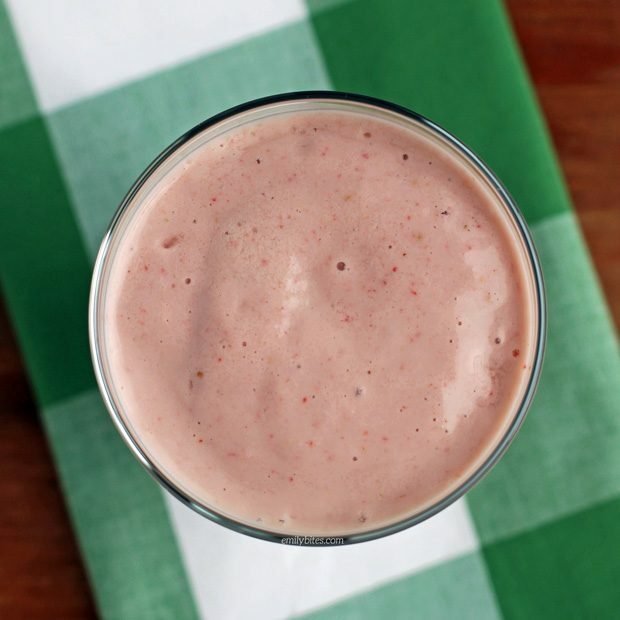 Looking for some other tasty lightened up breakfast recipes like this Strawberry Avocado Smoothie? Check out my Apple Streusel French Toast Muffins, Ham and Cheese Hash Brown Quiche, Maple Bacon Breakfast Wraps, Pear Gingerbread Baked Oatmeal Singles, Bubble Up Breakfast Casserole, Strawberry Banana Baked Oatmeal Singles, Hummus and Feta Omelet, Mini Dutch Baby Pancakes, Sausage Egg and Cheese Hash Brown Cups and many more in the breakfast category of my recipe index! Combine all ingredients in a blender and blend until smooth. If the smoothie is thicker than you would like (can happen if you use frozen fruit), feel free to add a little water and blend again to combine. Pour into a glass and drink up! *The SmartPoints program counts zero point foods differently when blended into a beverage (to learn more, read here). Part of the reasoning for this is to offset the possibility of members over-consuming fruit, etc and counting it as free (it’s much easier to over-eat fruit in a smoothie without feeling full than it is when you’re just eating the individual pieces of fruit). Since this smoothie only has 5 strawberries, a couple pineapple chunks and an individual container of yogurt (not an unreasonable amount to eat in one sitting), I sometimes track it as 3 SmartPoints (the total without the fruit and yogurt). I am not at all suggesting that anyone else do this, as it is not what Weight Watchers would officially recommend, I’m just letting you all know! How do you just use 1/4 of an avacado and save the rest? Nicole – I just leave the pit in the remainder and wrap as close to the fruit as I can with Saran Wrap or Cling Wrap. They also sell frozen avocado chunks now. I’m going to try this recipe with the frozen avocado. I may reduce the amount of ice I use, as my other fruit will likely be frozen as well. Btw can I use coconut milk instead of milk?